Enjoy lodging at our peaceful motel/hotel on Florida's pristine coastline. Floridana Beach Motel in Melbourne Beach, Florida, is a nonsmoking beachside motel/hotel. 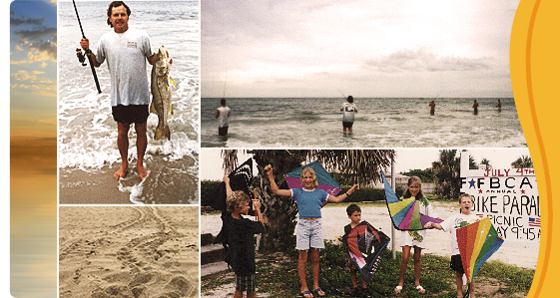 Take pleasure in surf fishing and deep sea fishing in the Atlantic, or flats fishing in the Indian River Lagoon. Watch giant sea turtles under star-filled skies crawl from the ocean to the dunes to dig their nests. Walk along the beach throughout the year, and collect beautiful and unusual shells along the coastline. 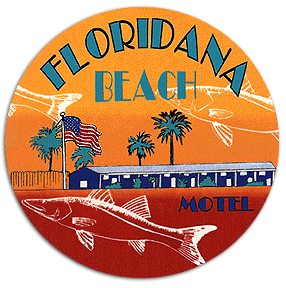 Built in 1952, the Floridana Beach Motel offers lodging on a rural stretch of barrier island that lies between Florida’s Atlantic coastline and the Indian River Lagoon. The coastline has changed little over the years with unspoiled views of miles of beaches and dunes. US Air and Delta Airlines service the city of Melbourne, which is 25 minutes north of the motel. Take Route 192 E. across the causeway to A1A. Drive A1A Highway S. for 11 miles. The motel is on the right, 1 block before the blinking yellow light. Take Route 95 N. to Exit 156 (Route 512). Drive on Route 512 E. (right) for 3 miles. Then, drive Route 510 E. (right) until it ends at the A1A. Take A1A Hwy N. (left) for 14 miles. The motel is on the left, 1 block past the yellow blinking light. Take Beachline Expressway East (Route 528). Then, take Route 95 S. to Exit 183 (Eau Gallie Boulevard). Drive east (left) on Eau Gallie Boulevard until it ends at A1A Highway. Take A1A Highway S. (right) for about 14 miles. The motel is on the right, 1 block before the blinking yellow light. Email us at floridana@earthlink.net about our great vacation rates. Please contact us at (321)726-6560 if there is no response to your e-mail request within 2 days. Proudly Serving Nationally and Internationally | Hours of Operation Monday–Sunday, 9 a.m.–9 p.m.